I have heard about Dic Sonnefeld's Cubed Burr many times over the last 5 or so years but never actually seen one or played with one. 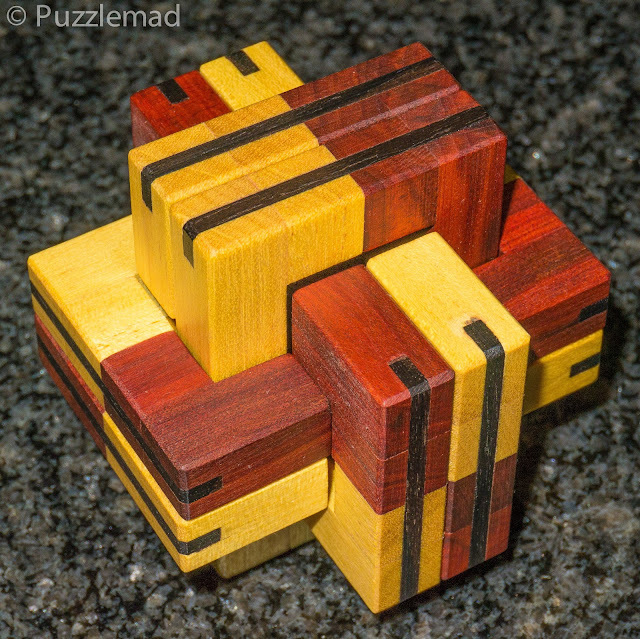 I had been told by a few people that it was a terrific puzzle designed without the aid of Burrtools (which many have claimed has lead to the design of hundreds if not thousands of extremely complex puzzles which have nothing of interest except that they have a very high level or very odd shapes). The Cubed Burr consists of nothing more that 3 fairly simple burr sticks in a simple frame and has a relatively low solution level of 9.13.4 moves. Without having seen it and only knowing very little about it, I made no real effort to acquire one. Then a VERY good friend of mine suggested this puzzle to both me and to Brian Menold as something that is not just a good puzzle but one that is ESSENTIAL. When this particular friend gives that sort of advice then both of us sit up and listen. He has been puzzling a very long time and has never been wrong to my knowledge in the advice that he has given me. If he says jump then that is what I do and ask questions later. Of course, a good craftsman always gets permission to produce a puzzle from the designer and I was luckily able to put Brian in touch with Mr Sonneveld and permission was duly granted. Brian made quite a few copies of the puzzle and, as always, used a wonderful selection of beautiful woods. I was hovering over my keyboard when the email update came in; I was poised and ready! "Don’t be fooled by number of moves in this one! It is only a 3 piece burr within a box, but these are moves that will really separate the men from the boys. 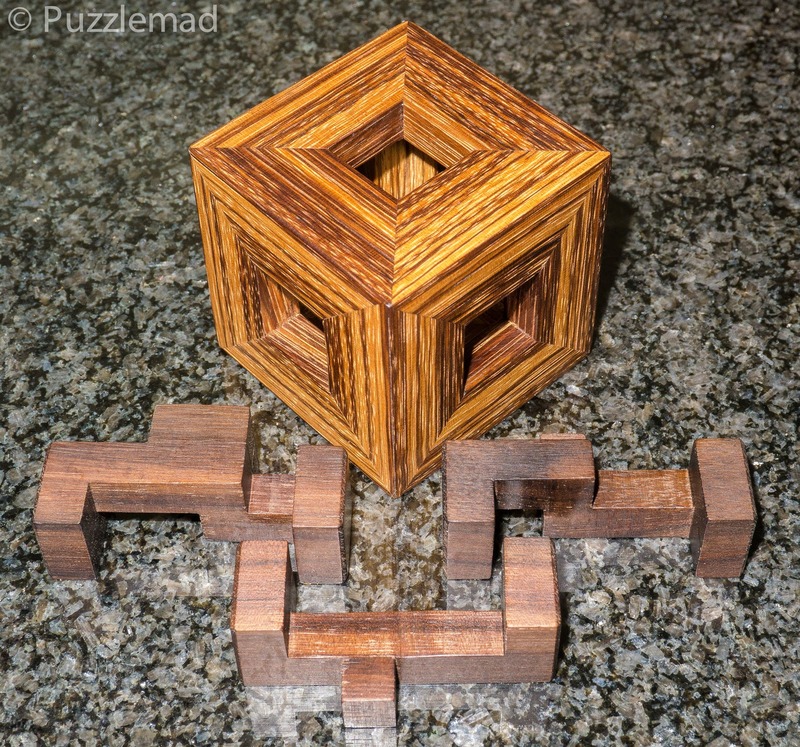 When I was putting these together I couldn’t see how anyone would be able to solve this puzzle without some sort of help. But that is my old feeble mind which finds everything to be a challenge! These are very hard to find, and when available, command some extremely high prices. I wanted to give the cube an interesting look (it deserves it) so I put a little extra work into the construction. There was also more waste than usual. So these definitely belong on every collectors shelf. A really terrific design!" How could I resist? I immediately ordered the above version - a Zebrawood frame with East Indian Rosewood pieces and 5.7 cm3 in size. They were all stunning but I am a sucker for Zebrawood! 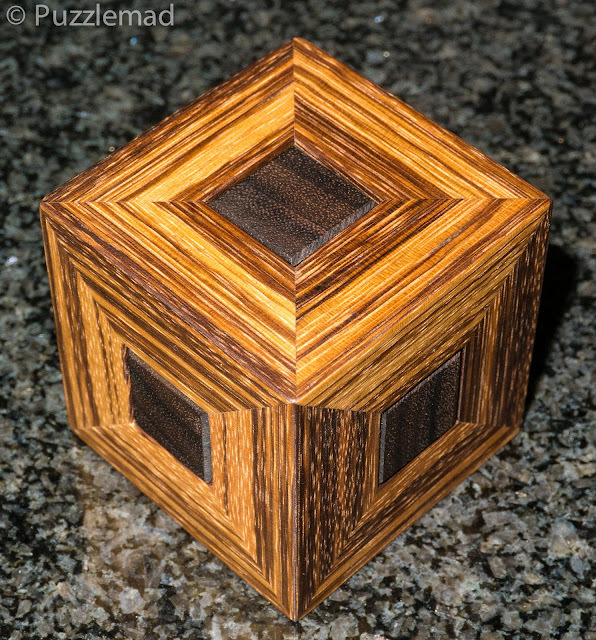 "A three-piece burr is contained within the cube. It is very difficult to disassemble and assemble, requiring rotations and other unnatural acts in addition to the usual burr movements." Mrs S had gone out one Saturday and I settled down with a lap cat and the Cubed Burr. I started exploring carefully. It is quite a confusing puzzle with a lot of possible moves which can go up blind paths for a little way before stopping dead and then forcing a back track. Not only are there a bunch of linear blind ends but there are also a fair number of rotational blind ends too! I have a very linear brain and trying to keep track of the turns was quite a task. Eventually by pure luck I managed to perform a couple of rotations and after peering inside the hole I had created, I suddenly realised that the first piece would slide out with a simple sequence. YESSS! I am a genius! Errrm, nope - I am not! With the removed piece precariously balanced on the sleeping cat's back, I continued my exploration. OMG!!! Not only does it require a good number more moves for the next extraction but there are lots and lots of possible linear moves and rotations. I quickly found myself getting lost and resorted to my old trick of moving to and fro in the solution ever more moves to try and keep my recall current. I spent a very happy couple of hours with sleeping cat and puzzle getting nowhere. When I thought I had exhausted every possibility it suddenly occurred to me that I could perform 2 rotations in a different order and this would allow a different direction of turn for the second. AHA! The 2nd and then third piece came out after about 4 hours of puzzling and I even managed to not disturb the cat! I am pleased to say that after so many hours moving just a few pieces I was even able to put it back together again! Yay! "As you may have seen me mention on this site, that I love Board Burrs. This is a follow up to Frans’ Tricoloure that I made a while ago. While this one doesn’t have any swapping of positions of pieces it does have two solutions which are equally difficult, both requiring 27 moves to solve. One solution is 2.13.4.5.3 and the other 2.9.8.5.3. Although the checkering of the pieces is decorative, it does provide an indication of the piece placements." I had previously bought and enjoyed the Tricolore and written about it here. 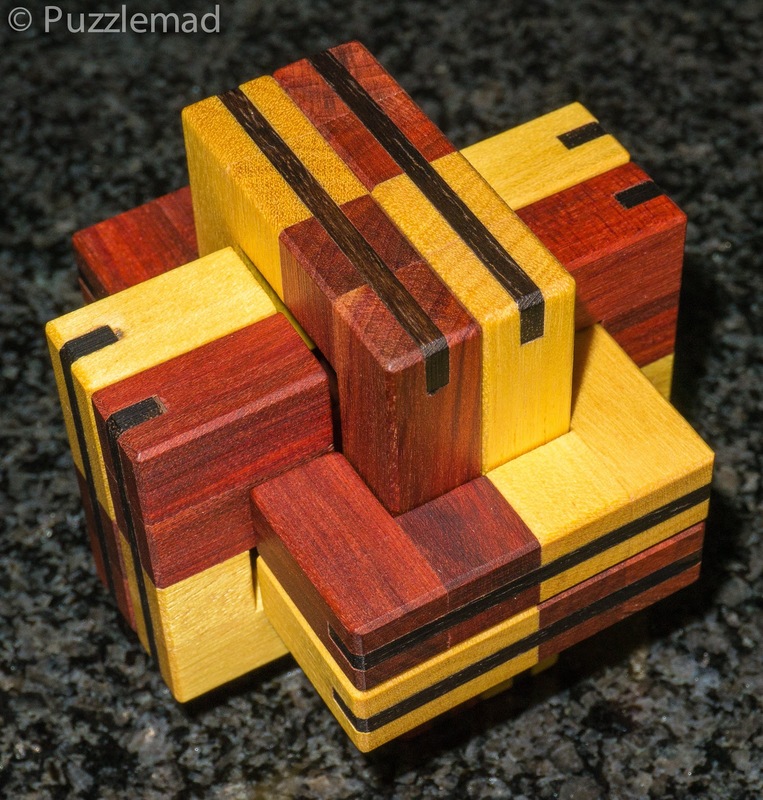 so was delighted when this puzzle looked so similar but had a completely different set of solutions. I opted for the version made from Redheart and Yellowheart with Ziricote splines. I received it in May this year and promptly began playing with the company of cat and Mrs S. I had a really nice time working through the solution to the assembled puzzle that had arrived and was pleased that it only took me a single evening to be able to both disassemble and reassemble it. The one that had arrived was the easier one with level 2.9.7.5.3 and it is marked out by the fact that the chequering is not quite right as you can see in the picture above. It only took a few seconds to find the first piece removal but after that it's a fun bit of exploration. Just look at the craftsmanship! I love the splines. I left it like that for a few days and then began to attempt the disassembly. 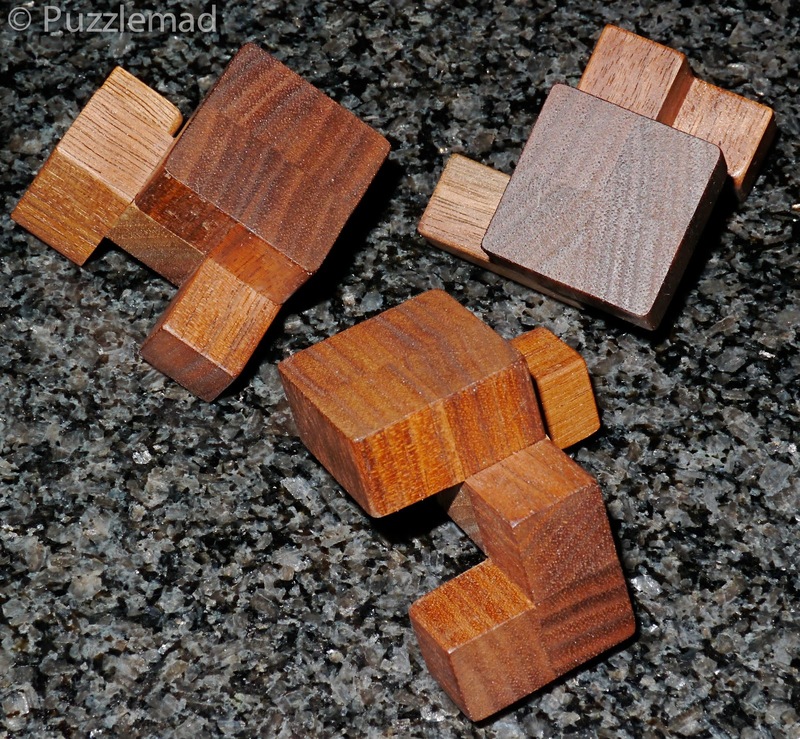 It has been sitting on my armchair for nearly 2 months in this assembled state and for the life of me I cannot find the sequence of moves to remove the second piece! If you look at the armchair picture on my New additions twisty update then you will see where it has been - it has caused a pain in my head for weeks and weeks and often a pain in my A if I sit down without remembering it is there. The moves for that second piece removal just seems to be so beautifully hidden that it has eluded me the whole time! Brian has me beaten! I will be keeping it on my armchair until I have solved it and can blame Brian for my backlog of unsolved puzzles - he is causing an obstruction! Thanks mate!! If you are interested then Brian has a few puzzles left over from recent updates and all are well worth a place in your collection. Go take a look. 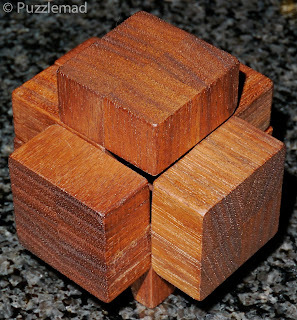 About Dic Sonneveld's Cubed Burr, ten years ago I made a copy of this puzzle. I were not so able like you in solving it. But finally I succeeded in having the solution from a really kind person: Bernhard Schweitzer. I must have been lucky! You are very right! Bernhard has an enormous knowledge of interlocking puzzles and especially those that involve rotations. There are very few people in there world who know more than him. Getting more popular - 900k pageviews!